NiQ Health’s commitment to improving the patient care experience highlighted with integration between their CarePlus™ nurse call system and ClinicAll®’s clinic infotainment system. The partnership between CarePlus™ and ClinicAll® integrates nurse call on patient entertainment terminals; this allows patients to choose the most appropriate alarm and message depending on their need and acuity. The advanced functionality of CarePlus™ allows patient alarms to be transmitted through SIP protocol and shown on nurses DECT or smartphones. This new functionality improves workflow and efficiency of nurses, allowing them to prioritise patient calls dependent on the urgency and type of call communicated through the CarePlus™ and ClinicAll® integration. A call-back feature is also enabled through this integration, with caregivers able to communicate directly with patients through their infotainment terminal handset. CarePlus™ provides call initiated by patients to be sent directly based on workflow rules to classifications of clinician ensuring the initiated call goes to the right skill staff member (Pain, Potty, Positioning) or to the support services (Food, Drink, Blanket, new appointment, discharge). The benefits are; improved patient safety and satisfaction with a significant return on investment. ClinicAll® Microsoft 8 software provides features enabling patients to select entertainment, information services, menu ordering or meal selection, Skype, telephone, and internet. 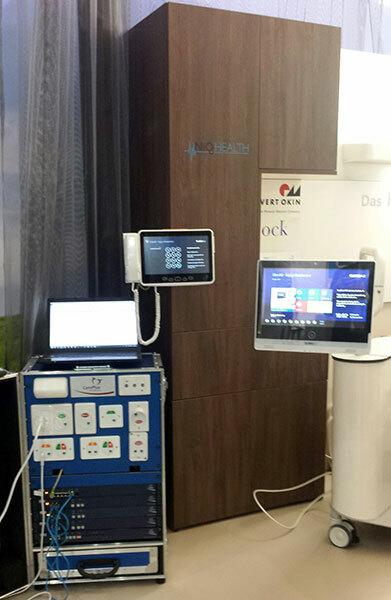 A demonstration of the Microsoft 8 Infotainment terminal integration to CarePlus™ and the active communication path (SIP) between the DECT Spectralink 7000 handsets and the ClinicAll® infotainment patient handset can be seen at Medica – Hall 15, Stand A 42 12 to 15 November.